LIMITED TO ONE - Three (3) foursomes included plus recognition on all promotional marketing for the event. Company will be featured on the USO of Indiana website, social media channels, and e-mail newsletter to USO of Indiana supporters. Name and logo will be displayed during the event plus recognition in the program. Includes recognition in the program and twelve (12) lunch tickets. LIMITED TO ONE - Three (3) foursomes included plus name and logo displayed on each golf cart at the event. Includes recognition in the program and lunch for 12 golfers. LIMITED TO TWO - Two (2) foursomes included. Company table and signage at beverage station. Recognition in the program. Lunch for eight (8) golfers included. Three (3) foursomes included plus One (1) Hole Sponsor sign. Includes recognition in the program and lunch for (12) golfers. Two (2) foursomes included plus One (1) Hole Sponsor sign. Includes recognition in the program and lunch for (8) lunch golfers. LIMITED TO ONE - Company logo on all rule sheets placed on golf carts at the event. One (1) foursome included with lunch for (4) golfers. LIMITED TO TWO - Company logo on beverage cart at the event. One foursome with lunch included. LIMITED TO ONE - One (1) foursome included plus company name and logo displayed on signage at the event. Includes recognition in the program and lunch for (4) golfers. One (1) foursome included plus One (1) Hole Sponsor sign. Includes recognition in the program and lunch for (4) golfers. Includes green fees, open range, ½ cart, lunch, refreshments awards & raffle prizes. Includes One (1) Hole Sponsor sign. I have read and agree to the Terms and Conditions and give my consent to USO Indiana to process my personal data. I understand I can revoke this consent at any time. Proceeds from the event go toward the five USO hospitality centers located throughout the state and help fund the many programs we offer at no cost that help keep military service members connected to the people and places they love. $125.00 per person includes; green fees, open range, ½ cart, lunch, refreshments, prizes and awards. 4-Person Team Best Ball Scramble with obstacles and challenges to overcome to make the day interesting. Tickets will be provided to enjoy lunch before or during your round and refreshments will be available at the course. 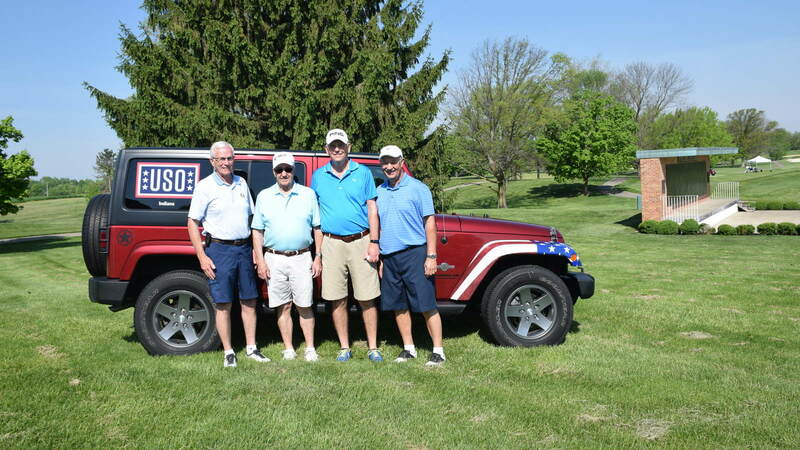 The USO of Indiana is a chartered affiliate of the USO, Inc. We rely heavily on the generosity of the people and businesses of our state to help us complete our mission. Thanks to our loyal supporters, Corporate Partners and Sponsors, the USO of Indiana can continue to deliver world-class hospitality and family programs at no cost over 100,000 service members and their families each year.